by Cassandra Profita Follow OPB/EarthFix Aug. 26, 2015 noon | Updated: Dec. 9, 2015 3:36 p.m.
It’s after 10 p.m. and I’m on a boat at the mouth of the Columbia River. We’re circling around East Sand Island, where thousands of seabirds are nesting in total darkness. I’m pretty sure the captain, Rob Gudgell, thinks I’m nuts. “Why did you want to come out at night?” he asks. 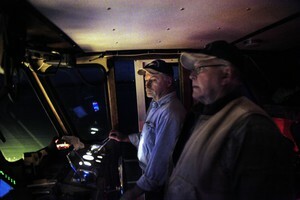 Milton Gudgell, right, and his son Rob Gudgell on a nighttime boat ride to East Sand Island. – about an hour after we left. They shot 16 cormorants. 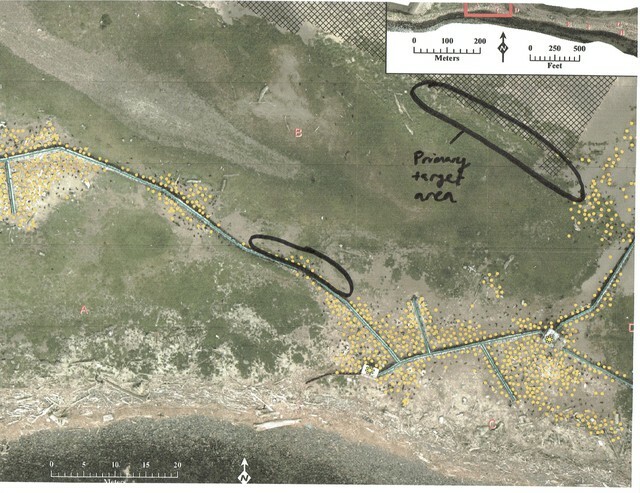 An aerial image of East Sand Island with areas targeted for shooting cormorants, according to documents obtained through a public records request. 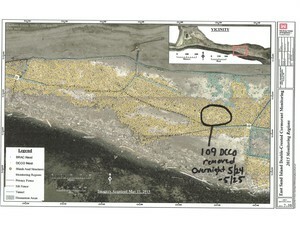 A photo of an area where cormorants have been killed, according to documents obtained through a public records request. Mike Patterson photographs birds on East Sand Island for the Wildlife Center of the North Coast. The public isn’t allowed on the island so Fee has been renting a plane and paying a biologist to fly over the island with a camera to track how the government operation is affecting the birds. She’s noticed there are far fewer nesting birds on the island than in previous years and the birds have abandoned some sections of the colony. 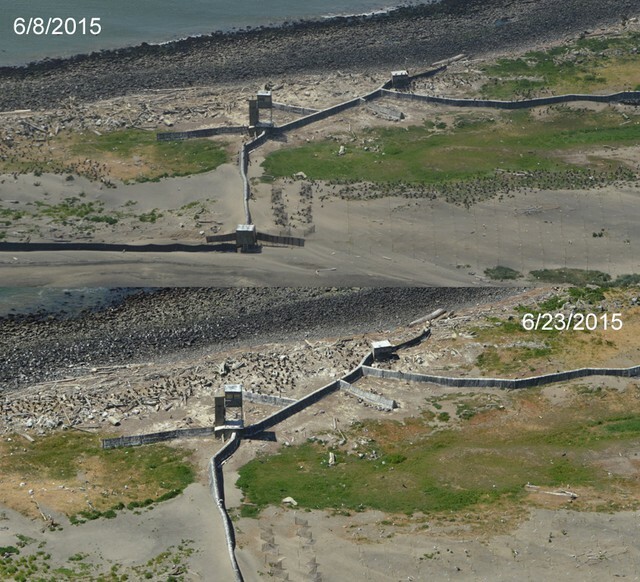 A composite of two aerial photos taken on two different days showing fewer birds in one area of East Sand Island over time. on how many adult cormorants have been killed. So far, it’s 158. That’s far short of the 3,500 birds the agency had planned to kill this year, but the nesting season isn’t over yet. 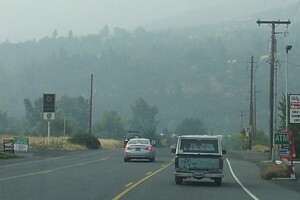 Joyce Casey, branch chief for environmental resources with Corps’ Portland district, says officials with the U.S. Department of Agriculture’s Wildlife Services, who are carrying out the operation, are being careful not to orphan baby birds by killing adult birds that are tending to chicks. An aerial photo marked with the location of 109 double crested cormorants (labeled DCCO) shot by officials with the U.S. Department of Agriculture’s Wildlife Services. 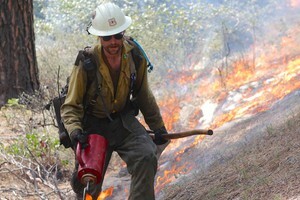 Ultimately, Casey says, the Corps is following direction from the National Marine Fisheries Service to shrink the size of the cormorant colony on East Sand Island to about 5,600 nesting pairs – less than half the current population – as one of dozens of actions needed to offset the negative impacts of hydroelectric dams. 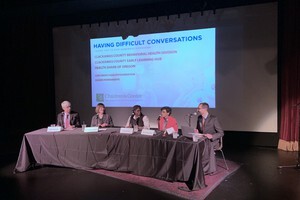 The Corps is doing extensive monitoring to keep track of what effects the culling operation is having so they can adjust their plans as needed, Casey says. They’re also oiling cormorant eggs to prevent new chicks from hatching; that will cut down on the number of adult birds on the island over time. 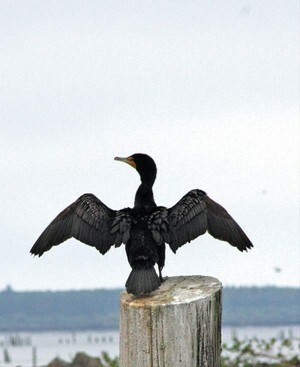 Several groups opposed to the the Corps’ cormorant management plan have teamed up and gone to court to stop the agency from killing the birds. 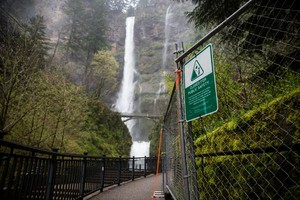 They say the Corps is blaming the birds for problems caused by dams and that killing birds isn’t going to save salmon. They recently received a U.S. Fish and Wildlife Services study through a court order that concludes killing cormorants won’t actually improve salmon runs in the Columbia River. The study found the fish the birds are eating would die in the ocean – even if they weren’t eaten by cormorants. Double-crested cormorants like this one spread their wings in the sun to dry after getting them wet in the pursuit of small fish in the water. East Sand Island near Chinook is the location of a major colony of the birds. 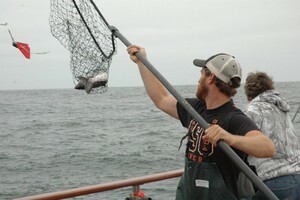 Fishing guide Bob Rees uses a net to pull in a salmon at the mouth of the Columbia River.